The Cardinal Towne Project is a sustainable, mixed-use, commercial retail and affordable housing development adjacent to the University of Louisville. 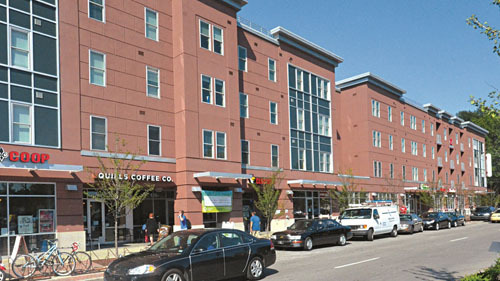 The Project provided much needed commercial retail services for the surrounding Old Louisville neighborhood and the University, facilitating economic and community development in this low-income area. The commercial tenants consist of primarily Louisville-based retail goods and services providers, including casual sit-down restaurants, book and media stores, and a neighborhood convenience store. The Project is located in an area characterized by abandoned industrial and dilapidated residential properties that had 37% of the residents living at or below poverty level. The Cardinal Towne Project provided increased economic opportunity to underprivileged residents, providing both employment opportunities and needed services. Metro Bank participated in the Cardinal Towne development as a co-allocatee of New Markets Tax Credits. By combining its tax credits with NCIF’s, the bank was able to bring powerful investment dollars to its Louisville community members. The bank was also able to generate fee-based income, supporting the sustainability of its mission and operations. The relationship formed between Metro Bank and the University of Louisville promises opportunities for collaboration in the future.